The story of J/Boats is a classic entrepreneurial tale: With a $20,000 investment, and a speedy 24-foot sailboat that Rod Johnstone built in his garage, Rod & his brother Bob Johnstone went into business. That was 1977. Now, that boat (the J/24), has become the most popular recreational offshore keelboat in the world. The Johnstone family has made an undeniable mark on the sailing world. In addition to the 5,400 J/24s cruising the waves, there are over 7,000 more J/Boats, ranging from the International J/22 to the J/65, that sailing enthusiasts have bought at prices ranging from $10,000 to $2,000,000. While other manufacturers may sell more boats, the Johnstones have won the high-end, performance-oriented segment of the market. Theirs is the so-called racer/cruiser category: boats that perform well on the race course but which are comfortable and easy enough for the family to day-sail and cruise. It is with knowledgeable, experienced sailors that the Johnstones have done best. The story begins in 1975. 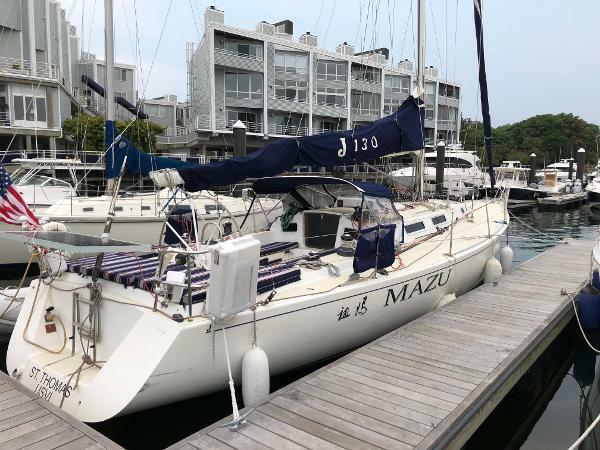 Rod, then an ad salesman for the sailing trade magazine, Soundings, and an active one-design sailor decided to build a sailboat he had been designing since completing a Westlawn School of Yacht Design correspondence course in the 60’s. With $400-worth of fiberglass and wood, some rigging and hardware left over from a Soling of Bob’s, he built the 24′ x 9′ wide RAGTIME on weekends in his 3 car garage at his home in Stonington, Connecticut. During the summer of 1976, with an all family crew aboard, RAGTIME beat everything in sight. Rod realized he had created something special. Enter Everett Pearson, the owner of Tillotson Pearson, Inc, a highly respected boat builder in Warren Rhode Island. He was quite taken with Rod’s design and agreed to produce the boat on spec in return for the U.S. building rights. Display ads in Soundings got the word out. That winter they set up a makeshift factory in an old textile mill in nearby Fall River, Massachusetts, and began producing J/24s. Enter the marketing experience of brother Bob, a vice president of marketing at AMF/Alcort (the makers of Sunfish sailboats at the time). He saw the potential in the boat Rod had designed. From 1975 to 1977, Bob had helped to take Alcort from the red into the black, and then began trying to convince AMF to start producing a boat similar to the J/24. But, he says, in spite of overwhelming market research results showing 50% purchase intent in a boat like the J/24 , AMF really didn’t care anything about gaining share of market or investing any more in sailing. So, in February of 1977, at age 43, Bob left AMF and threw in his lot with J/Boats. With Rod contributing the design and his prototype ‘Ragtime’ and Bob investing $20,000 to cover start-up costs, office space, and advertising, their 50-50 partnership was launched. Hoping to sell 50 J/24s that first year, they sold 75 in 1977. The business has grown significantly since; each successive year marks unique achievements in the sport and industry.